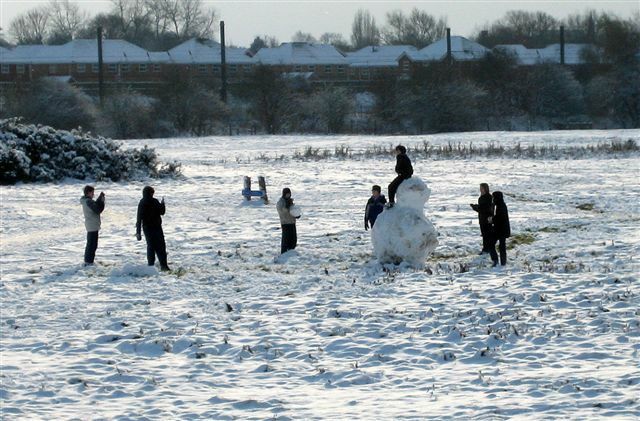 Some more memories of growing up in the area around Hob Moor have been added here. Some details of who to contact to report issues (litter, motor cyclists, etc.) have been added to the Contacts section. A short section on where the name Hob Moor may have come from can be found here. The minutes of the AGM 2009 Minutes are now available. Teams from Probation Services and BTCV have worked on 26 separate days this summer clearing thistles from the central area of the moor. This has helped the wildflowers in the area and has also significantly reduced the steady streams of thistle seeds that usually drift across the moor at this time of the year. As mentioned in July (below), the cows this year are from a different farmer from previous years. If you would like to know more about them and the farmer, or are interested in sampling the produce, you can link to the farmer’s website here. There were lots of strange goings on last night on the moor (Sept 3rd). A helicopter circled over the moor about 9.30pm and then landed in the middle. It then took off and hovered over the moor for over an hour, landing once again, whilst police restricted access across the moor. It was very unclear at the time what was going on, but it appears that the police had called in a helicopter with a heat-sensitive camera to look for a missing woman. The York Press website has a brief report about it here. Our Newsletter 2009 August – No 23 is now available with updates on all our latest news, including the details of our AGM in October. The cattle this year are owned by a different farmer from previous years. There about 35 of them and they are South Devon cattle, aged between 8 months and 11 years. Thistle cutting is now taking place regularly by BTCV (British Trust for Conservation Volunteers) and Probation Services. Some new photos of butterflies have been added here. Creeping thistle, as its name implies, creeps. And over the last few years it has crept across large areas of the moor. It is now seriously encroaching into the nesting areas for skylarks and meadow pipits and is also starting to strangle the wildflowers. To bring the thistles back under control and reduce their hold in coming years, the City of York Council have carefully assessed their options for dealing with the problem and are now starting on a programme of cutting. In the sensitive areas around the middle of the moor, the thistles are being strimmed by hand. This process will be repeated every month, thereby weakening the plants considerably. In the outer areas of the moor where no birds nest, some cutting will be done by machine. Wildflowers thrive in infertile conditions. So, in order to reduce the fertility, the cuttings will be removed. Also, it is important not to stifle other vegetation by leaving the cuttings behind. An additional reason for cutting the grass is that the cattle will be arriving shortly and the long grass is likely to be too long and tough for the cows to eat. Cutting the grass will stimulate new growth for the cows to eat. A further programme of thistle eradication will be carried out next year with a review to assess the results. 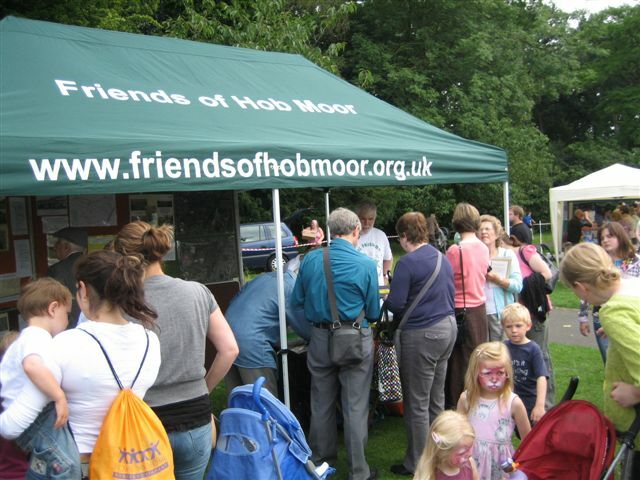 Friends of Hob Moor had a stand at West Bank Park Summer Fair on June 28th. There were well over 1,000 people there and there was a great deal of interest in our stand. Of particular interest were the large aerial photos we had on display and also some new photo cards we’ve produced for sale. The cards sold very well, so we will also be selling them at the AGM in October. Eleven new members joined as well, so it was very successful all round. A recording of a skylark singing on Hob Moor has been added in the birdsong section of the birds page here. A new section on the becks around Hob Moor has been added here. Also, a number of new photos of the plants on the moor have been added to the Flowers and Grasses section here. The cattle have been late in arriving this year. 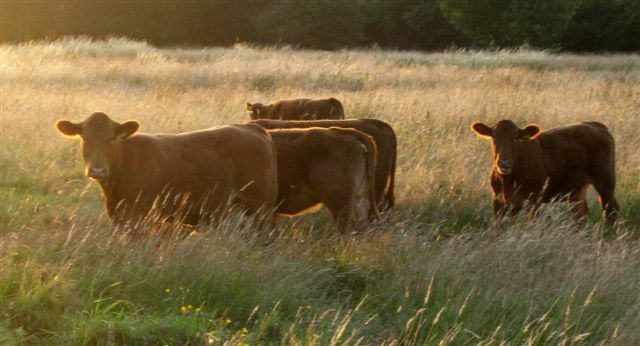 The Council commissioned an agricultural report to look at the effect of cattle on land such as Hob Moor, so that they could determine the optimum number. The report has now been received and 35 cattle should be arriving towards the end of June (there were 59 last year). This unfortunate delay has, however, resulted in a very attractive moor this year with a sea of red sorrel among the buttercups. All the back issues of the newsletters have now been added to the website and can be found here. 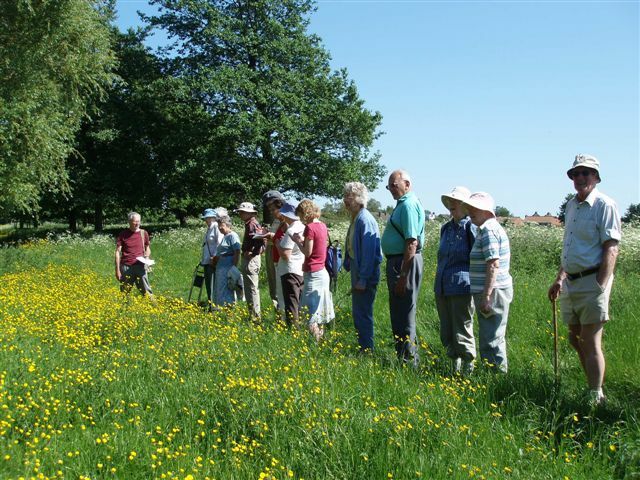 Mark Tyszka led another fascinating nature walk, here explaining about the three different types of buttercups to be found on the moor. 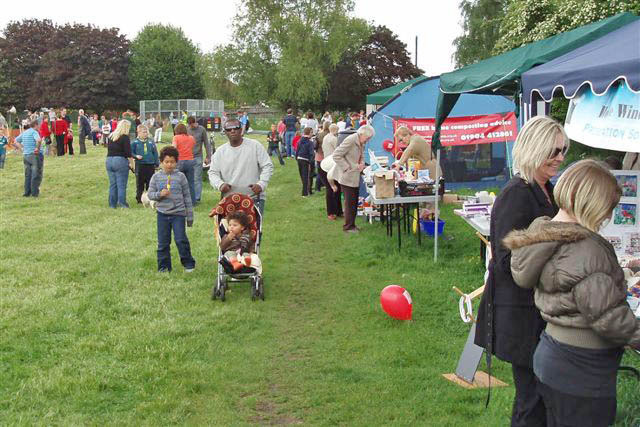 The annual Hob Moor Fair took place on Saturday 23rd and was a great success. As well as the usual attractions such as the falconry display and dog show, this year there was also a climbing wall, trampolining and a bouncy castle, which were very popular. Around 1,000 people came along. A new aerial photo by Anthony Crawshaw has been added to the Photos & Maps section. The Newsletter 2009 May – No 22 is now available. Five male mallard ducks are to be seen regularly on the becks as well as in the skies over Hob Moor. Has anyone seen any females for them? A small section on butterflies and moths has been added to the website. You can view it here. A new section on flowers and grasses has been added to the website. You can view it here. A new section on hedgerows has been added to the website. You can view it here. An aerial photo of the moor taken in 1999 has been added to the others taken in 2007 and 2002. View it here. The first skylark of the year was heard on February 21st. Although they can’t be heard regularly until the nesting season between April until July, they can occasionally be heard on clear, sunny days beforehand.